I recently wondered whether developing countries were asking for the wrong thing in Bonn. Now Bolivia is barking up the right tree with a proposed “climate debt” concept. The idea’s actually quite old; it’s already well developed in the Greenhouse Development Rights framework. Election ’08: A plan by Barack Obama to redistribute American wealth on a global level is moving forward in the Senate. It follows Marxist theology – from each according to his ability, to each according to his need. Obama would give them all a fish without teaching them how to fish. Pledging to cut global poverty in half on the backs of U.S. taxpayers is a ridiculous and impossible goal. If you’re worried abut gasoline and heating oil prices now, think what they’ll be like when the U.S. is subjected in an Obama administration to global energy consumption and production taxes. Obama’s Global Poverty Act is the “international community’s” foot in the door. Obama has called on the U.S. to “lead by example” on global warming and probably would submit to a Kyoto-like agreement that would sock Americans with literally trillions of dollars in costs over the next half century for little or no benefit. Oh, really? Who’s to say we can’t load up our SUV and head out in search of bacon double cheeseburgers at the mall? China? India? Bangladesh? The U.N.? I suspect that these sentiments are quite prevalent, at least in the US. I’m even sympathetic in at least one respect: transfers from the global rich to poor are beneficial in principle, but difficult to execute. Transfers from country to country are susceptible to capture by elites. Direct transfers among individuals could be facilitated by a global carbon market with allowances allocated to individuals (one of the few good arguments for emissions trading in my mind), but would undemocratic regimes permit their citizens to participate? I don’t see agreement on this front any time soon. I could see things going a different way: the US, EU and a few other developed nations move to reduce, then goad developing nations along with a mixture of carrot (offset projects and other transfers) and stick (border carbon adjustments). Is the BC Carbon Tax Fair? That’s the title of a post today at The Progressive Economics Forum, introducing a new report from the Canadian Centre for Policy Alternatives. In this study, we model the distribution of BC’s carbon tax and recycling measures. 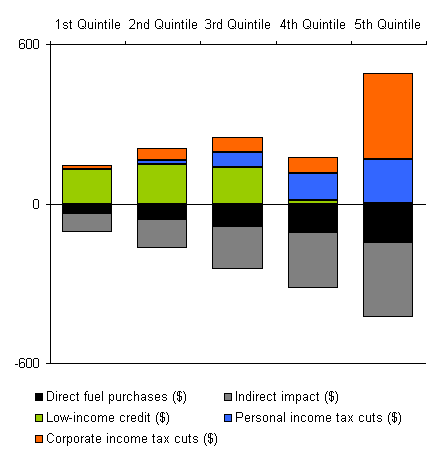 Our results conirm that BC’s carbon tax, in and of itself, is regressive. However, the overall carbon tax and recycling framework is modestly progressive in 2008/09 ’” that is, low-income families get back more in credits, on average, than they pay in carbon taxes. If the low-income credit is not expanded, however, the regime will shift to become regressive by 2010/11. It is important for policy makers to rectify this situation in the 2009 and future budgets by minimally ensuring that the credit grows in line with the carbon tax. A second concern with the carbon tax regime is that tax cuts undermine a progressive outcome at the top of the income scale. In 2008/09, personal and corporate income tax cuts lead to an average net gain for the top 20% of households that is larger in dollar terms than for the bottom 40%. Author TomPosted on October 31, 2008 Categories Climate, Ethics & Equity, Policy, Regional Climate InitiativesTags British Columbia, carbon tax, distribution, equity, fairness, income, revenue recyclingLeave a comment on Is the BC Carbon Tax Fair? I’m at the 2008 Balaton Group meeting, where a unique confluence of modeling talent, philosophy, history, activist know-how, compassion and thirst for sustainability makes it hard to go 5 minutes without having a Big Idea. Our premeeting tackled Ethics, Values, and the Next Generation of Energy and Climate Modeling. I presented a primer on discounting and welfare in integrated assessment modeling, based on a document I wrote for last year’s meeting, translating some of the issues raised by the Stern Review and critiques into plainer language. Along the way, I kept a running list of assumptions in models and modeling processes that have ethical/equity implications. Technical choices in models have ethical implications. For example, choices about the representation of technology and resource constraints determine whether a model explores a parameter space where “growing to help the poor” is a good idea or not. Modelers’ prescriptive and descriptive uses of discounting and other explicit choices with ethical implications are often not clearly distinguished. Decision makers have no clue how the items above influence model outcomes, and do not in any case operate at that level of description. 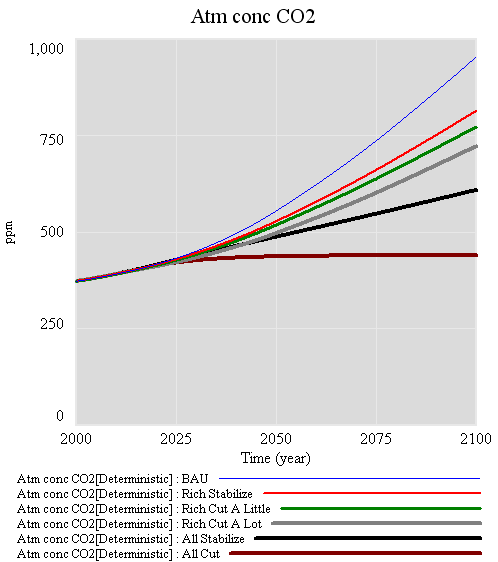 Climate War Game – Reduction Illusion? Is the cup half empty or half full? It seems to me that there are opportunities to get tripped up by even the simplest emissions math, as is the case with the MPG illusion. That complicates negotiations by introducing variations in regions’ perception of fairness, on top of contested value judgments. 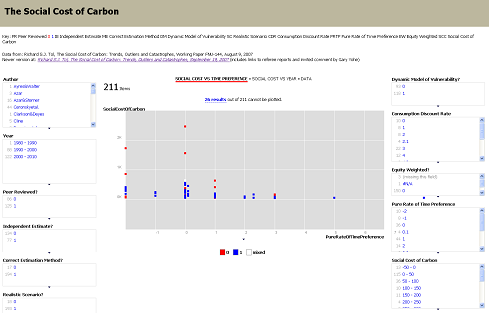 Author TomPosted on August 5, 2008 Categories Clout & Climate ChangeTags allocation, Climate, emissions, equity, GHG, Policy, regionalLeave a comment on Climate War Game – Reduction Illusion?